For many years, the nonprofit sector’s strategy for diversifying the leadership of our organizations has been guided – or more accurately mis-guided – by assumptions about people of color. When our team at the Building Movement Project started digging into why for a decade or more, people of color are less than 20% of nonprofit leaders, we heard a lot of explanations from influencers in the field. Most were variations on a theme: people of color weren’t ready for or interested in the top executive role. Two years ago, we launched a national survey to learn from nonprofit staff around the country about their experiences with, and perspectives on, the nonprofit racial leadership gap. The findings from 4000+ respondents, described in our first Race to Lead report, showed that people of color were as qualified to lead as white respondents, and people of color aspired to become nonprofit leaders at a higher rate than their white peers. Those taking the survey also agreed that there are structural barriers facing people of color seeking nonprofit leadership positions. 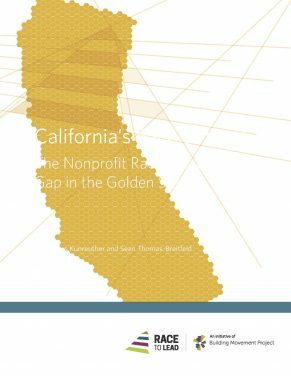 Last week, BMP released its newest report titled California’s Race to Lead: The Nonprofit Racial Leadership Gap in the Golden State – supported by the David and Lucile Packard Foundation – based on more than 800 Californians who completed the national survey and on the insights by participants in four focus groups held in the state. The data shows that there is a “Golden State difference.” Californians of color reported more leadership supports than did people of color in other states; and their rates of challenges and frustrations were lower too. But nearly a third of people of color in California reported that their race had negatively impacted their advancement in the nonprofit sector, and there were larger salary gaps between white Californians and people of color than we found in the rest of the country. Our conclusion from the findings is twofold. Although the results looked similar to the national data, there was consistent evidence from the California respondents that the state was moving in the right direction. At the same time, in spite of the push to increase financial supports, serious barriers persist which call for more attention to the issues of race inequity in the nonprofit sector across the state. Download the full report California report and to find other Race to Lead reports and information here. Sean Thomas-Breitfeld and Frances Kunreuther are Co-Directors of the Building Movement Project, a national organization that develops research, tools, training materials and opportunities for partnership that bolster nonprofit organizations’ ability to support the voice and power of the people they serve.